Grace Yang loves everything about the FBI, and she often drags her best friend, Sophie Young, along with her on late-night stakeouts in their neighborhood. One night, as they spy on the school counselor, Dr. Agford, the girls are convinced they see her committing a violent crime. Though these claims turn out to be unsubstantiated, neither girl can shake the feeling that this unusual woman, with her fake breasts and giant wig, isn’t quite what she seems. Despite the challenges it creates in their family lives - and in their friendship - the girls become determined to uncover the truth. It’s difficult to find a really compelling middle grade mystery. Many are either boring, predictable, or implausible, and few manage to keep the reader guessing to the end of the story. The Wig in the Window, therefore, is a pleasant surprise because it has an exciting premise, unexpected twists and turns, interesting characters, and mostly believable situations. From the outset, I was as invested in the characters themselves as in the mystery they attempt to solve, and I was impressed by how the author could develop such an authentic tween vibe within the context of a mystery story. Often, middle grade mysteries feature precocious kids who have professional detective agencies, or else the main characters are older teens like Nancy Drew. It is so refreshing to have a truly scary and suspenseful mystery story that also manages to reflect the interests, concerns, and speech patterns of its target audience. Next to the mystery plot itself, this book’s strengths lie in characterization. Especially impressive to me is the way the author develops the layers of Ms. Agford’s character. She keeps the reader guessing from chapter to chapter, and manages to make Agford both sympathetic and truly detestable depending on the evidence currently being explored and the character with whom she is interacting. Another delightful addition to the story is Sophie’s new friend Trista Bottoms, who is the target of tormentors who call her “Boom Boom Bottoms.” I love that Trista is not only confident enough to ignore those negative comments, but also technically savvy and completely capable in ways that Sophie and Grace are not. Her can-do attitude is truly refreshing and it provides a nice challenge to middle grade stereotypes about victims of bullying. 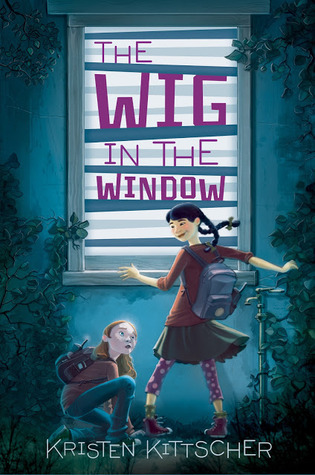 The Wig in the Window is a logical read-alike for The Secret Life of Ms. Finkleman by Ben H. Winters, as both books explore the mysteries surrounding a middle school faculty member. It is most likely to appeal to readers who actively seek out mystery novels, but it also has lots to offer fans of the school stories and friendship stories that are so popular with this age group. Other similar titles include the Sleuth or Dare series and the Ruby Redfort series.